Tag line: "2000 cast members, 3 orchestras, 33 rooms, 300 years, ALL IN ONE TAKE"
Every so often, a film comes along that, by its very technique, demands recognition. Russian Ark is just such a film. There's not a single cut, fade or dissolve in this entire movie, not one editor’s splice. Filmed on location at the Hermitage museum in St. Petersburg, it is, at 90 minutes, the longest uninterrupted shot in cinematic history. We follow the narrator (represented by the camera in a point-of-view perspective) as he navigates the halls of the Hermitage, mysteriously traveling through time as he does so. Acting as our guide to this wonderful retelling of Russia's past, the narrator meticulously uncovers the events of yesteryear as they occurred in both St. Petersburg (via a quick visit from the 18th century’s Peter the Great, played by Maxim Sergeyev) and the Hermitage itself (a series of six buildings commissioned by Catherine II in 1754, the Hermitage once served as the ancestral palace of the Tsars, and currently houses hundreds of Russia’s most prestigious works of art). Along the way, he meets a French aristocrat from the 19th Century (Sergei Dontsov), a man known only as the Marquis de Custine, who appears to be traveling along a similar time-line. The Marquis, a scathing critic of Mother Russia, joins the narrator on this journey of discovery, stopping occasionally to admire the beautiful artwork that adorns the walls of the Hermitage. On their travels throughout the museum, these two companions encounter various historical figures, including Catherine the Great (Mariya Kuznetsova) and Tsar Nicholas II (Vladimir Baranov), and by the time Russian Ark is over, we will have visited every room in the Hermitage, and covered the highlights of 300 years of history. There are scenes of both sweeping grandeur (such as the ballroom dance, which boasts three...that's right, three...performing orchestras) and quiet simplicity (in one marvelous sequence, we follow Anastasia, the daughter of Nicholas II, as she playfully runs through the hallway with several ethereal friends). The artistic and cultural connections that exist between Russia and the rest of Europe are given a once-over as the narrator and the Marquis argue extensively over the country's accomplishments in the social arena. But Russian Ark does not shy away from brutality, and along the way we experience a little harsh reality as well when, in one room, we spot a man hard at work constructing coffins, which will house the remains of the many poor souls of St. Petersburg (then known as Leningrad) killed in battle during World War II. 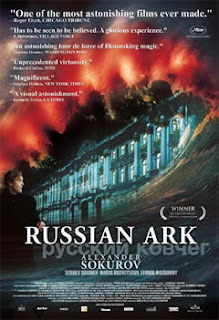 I was completely overwhelmed by the experience of watching Russian Ark. I bathed in its beauty, was enraptured by its grand scope, and basked in the glow of a bright and courageous filmmaker who has brought to life an amazing work of art. The cinematic accomplishments of Russian Ark are enough in and of themselves to assure it a place in the annals of film history. The fact that it is flawlessly executed makes its very existence an absolute miracle. I haven't seen this yet, but when a local Blockbuster went out of business, I bought a copy. Now I'm even more curious to see it. @Steve: Yes, definitely check it out! A lot of people complain that it's slow and boring, but I get so wrapped up in its beauty, and am so consistently blown away by the whole "one-shot" technique, that it never drags for me. And while it's sad that Blockbuster is fading, I have to admit I've also picked up some great movies cheap at a few "going out of business" sales! Hope you enjoy the movie, and thanks for the comment. Thanks for posting this! I'm definitely checking this one out. Having made a very brief tour of the Hermitage in 1987, i'm intrigued to revisit this incredible place through what looks to be a pretty amazing film experience. Klaus: WoW! I'm jealous. After seeing this film, I would love to tour the Hermitage. I'll be interested to hear how the movie matches up to your experience with it. Thanks for stopping by, and for the comment. It's always appreciated!